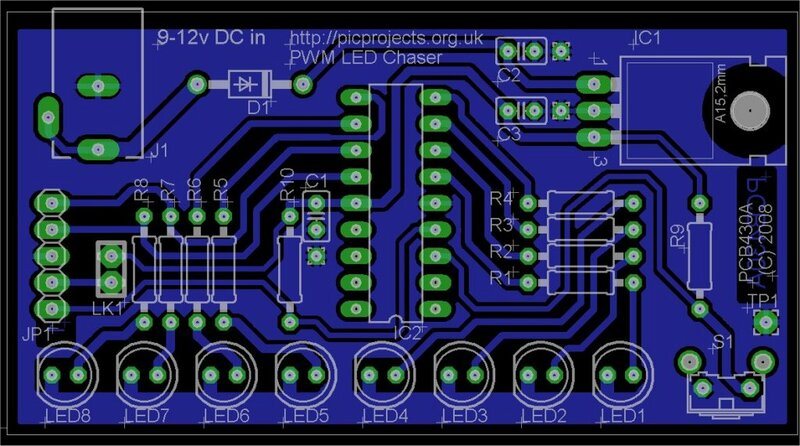 Here's a couple of variations I've built based on the basic PWM LED chaser described on this page. 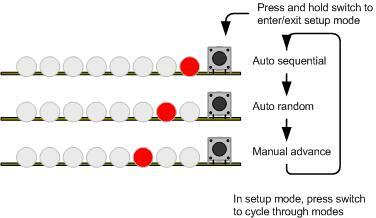 They run exactly the same base code, just use different sequences to suit the layout of the boards. 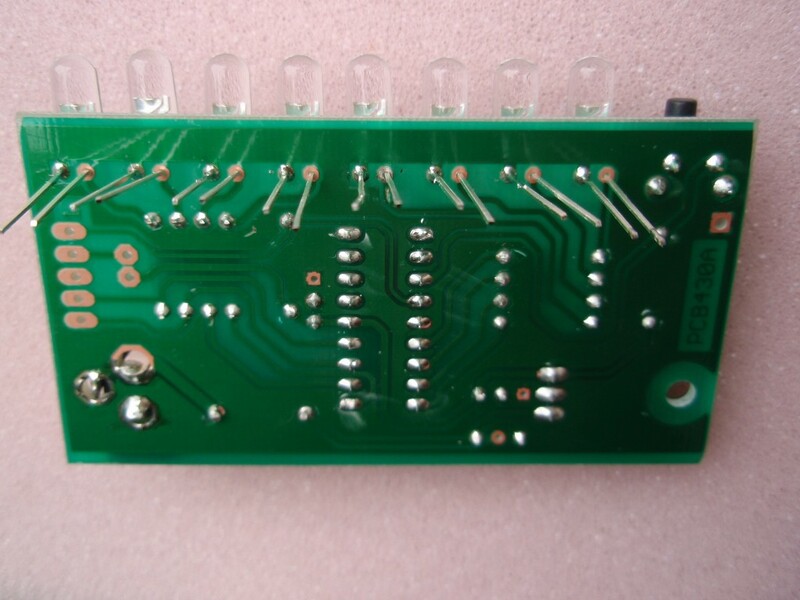 The heart of the LED chaser is the PIC 16F628A microcontroller, IC2. 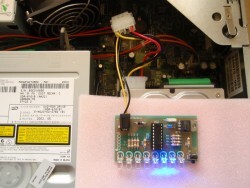 The program that runs on this chip controls the LEDs attached to the output port pins. 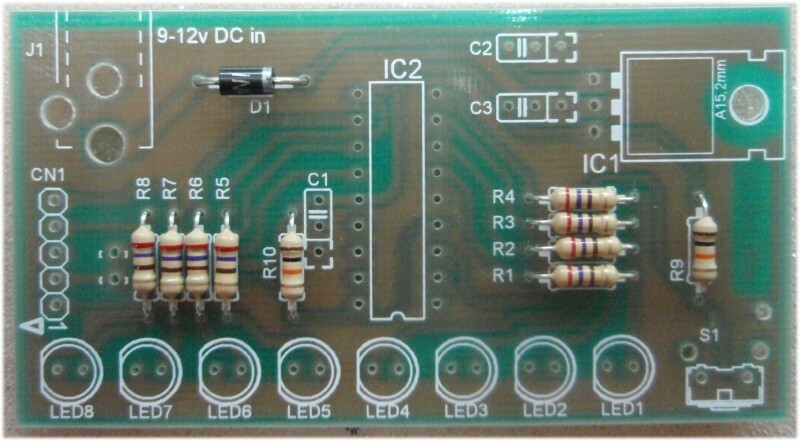 Resistors R1 thru R8 limit the current through LED1 - LED8 to a safe level that won't damage the PICs I/O ports or LEDs. 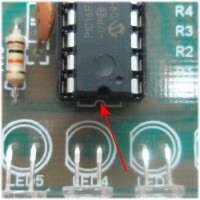 Resistor R9 provides a pull-up for the input connected to switch S1. R10 pulls up the PIC's MCLR reset signal during normal operation while allowing the input to be raised to 12.5 volts during in-circuit programming. 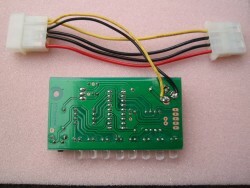 JP1 provides connection for an ICSP programmer such as a PICkit2 making it easy to reprogram the PIC without removing it from the PCB. 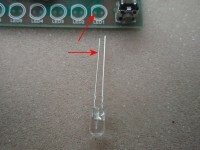 Capacitor C1 is used to decouple the 5 volt power supply to the PIC. If you're building the circuit on a breadboard or stripboard you should ensure it is located close to the PICs Vdd connection (pin 14 ). 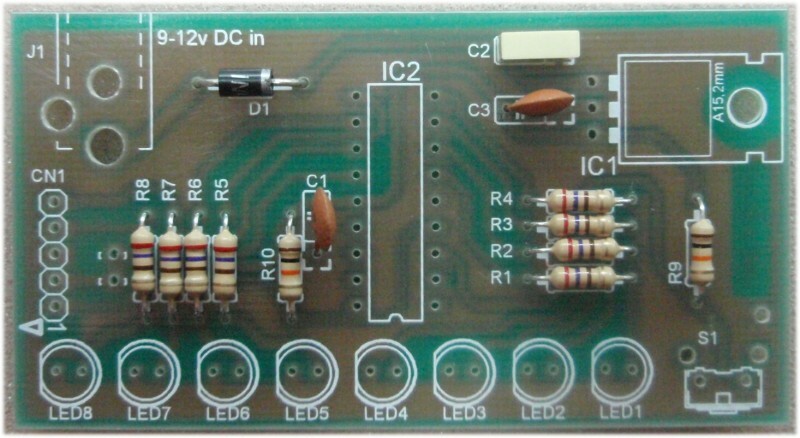 Power is supplied to the circuit via J1 and must be smooth DC between 9 and 14 volts. 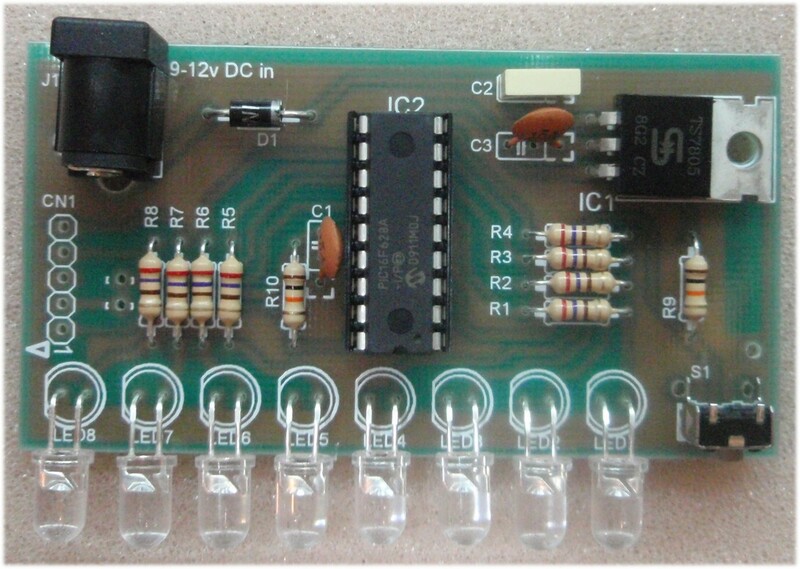 The PIC requires a precisely controlled 5 volt supply and this is provided by IC1, a 7805 3-terminal, 5 volt regulator. Typical current drawn by the circuit with all LEDs on is only around 100mA so the voltage regulator doesn't require any additional heatsink. 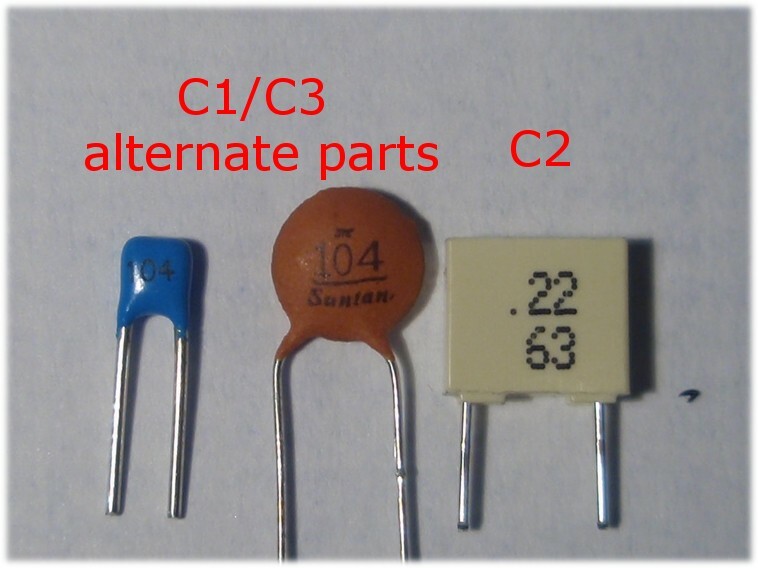 Capacitors C2 and C3 stabilize the regulator. Diode D1 protects the circuit from accidental reverse polarity of the input voltage. 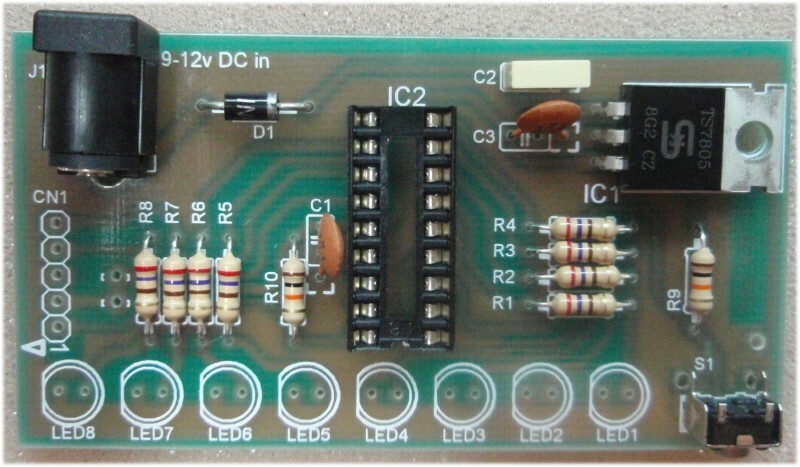 Capacitors C2/C3 stabilize the voltage regulator and may be omitted for most applications, however the schematic shows them and the PCB layout makes provision for them. If you're unsure whether you will need them then it's best to install them. 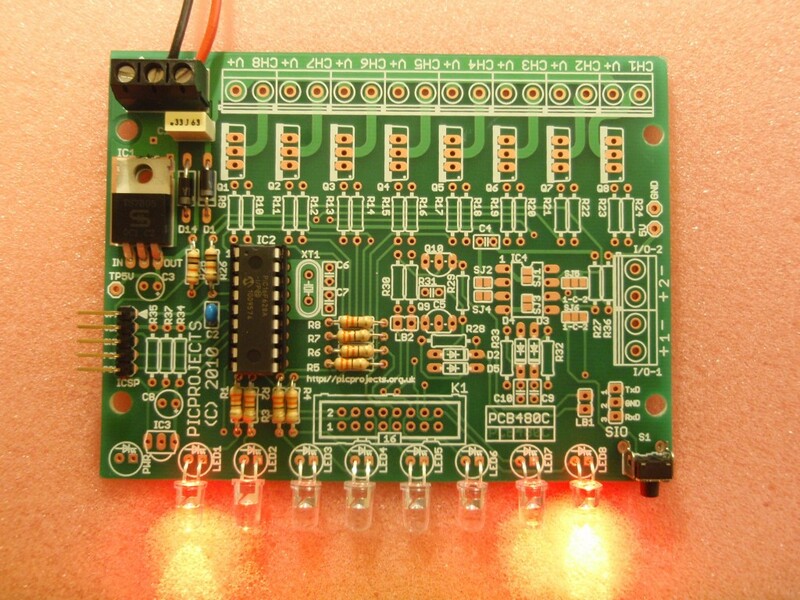 The latest high brightness LEDs are very bright even with 270R current limiting resistors. However, if you do need to change these resistors for some reason take into account the maximum current that the PIC can source from an I/O port pin is 25mA, and also be aware that the output voltage will drop as you increase the load. If you install LEDs that require a lower value series resistor you may find you are unable to program the PIC in-circuit via the ICSP header. 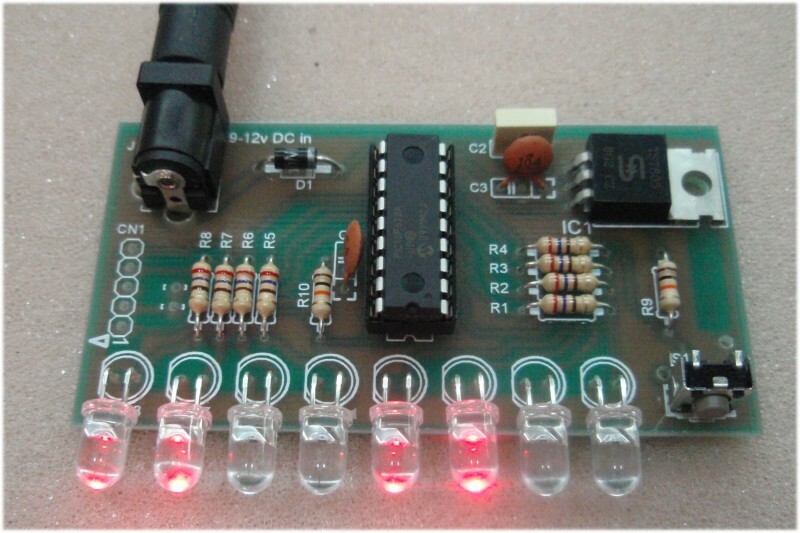 This is because the I/O port pins on the PIC that are used for In-Circuit Serial Programming are shared with the LEDs. The programmer may be unable to drive these lines when lower value resistor are used. With the 270R resistors and PICKit2 programmer, In-Circuit programming should work without problems. JP1 is an ICSP header to allow programming of the PIC while installed in the circuit. 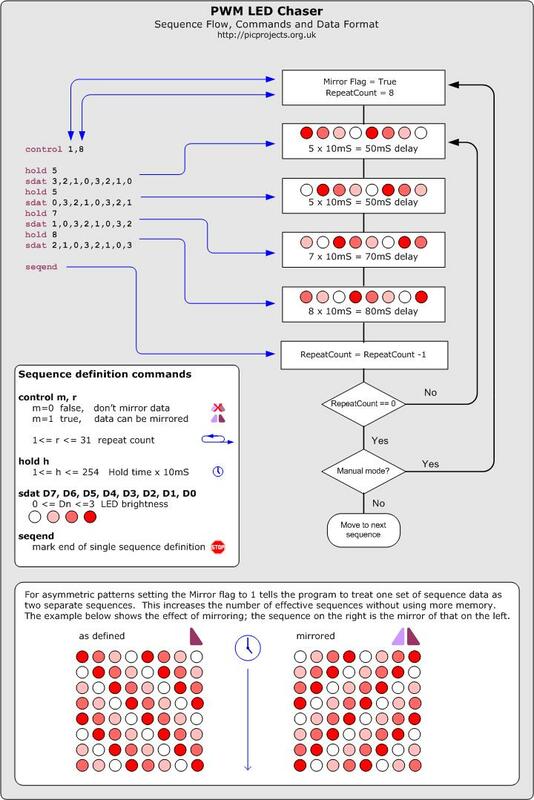 It is only required if you intend to connect a programmer to modify the sequences or code. It is not supplied with the kit. 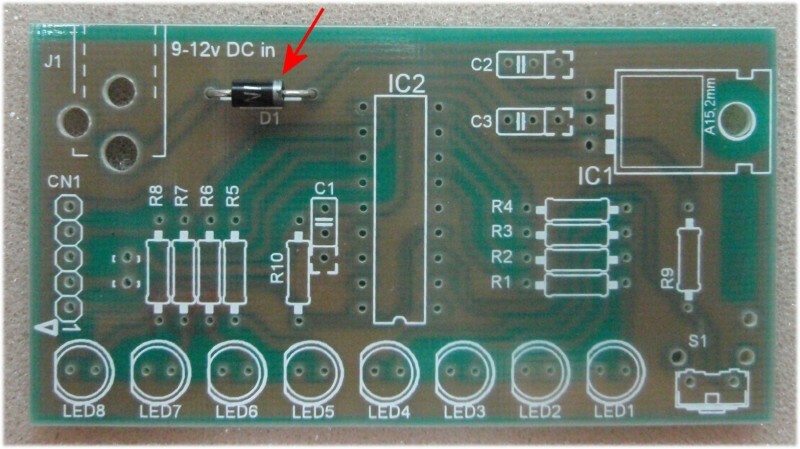 If you have an external 5V supply, you can omit D1, C2, C3 and IC1. 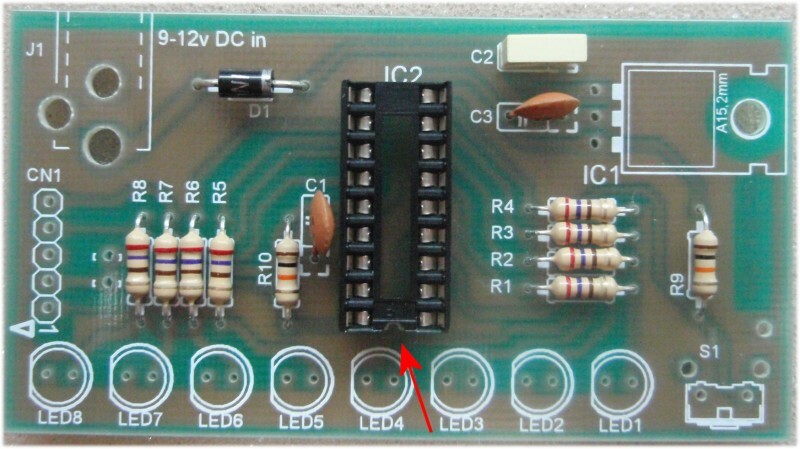 You will need to install wire links in place of D1, and between pins 1 and 3 (in-out) of IC1. The circuit will now work from the external 5V supply. Be sure to connect it up correctly because without D1 in place there is no reverse polarity protection. You can buy all the parts needed to build this project from most component suppliers world wide. In the UK you can get everything from Rapid Online and I've included a parts list with their part numbers below. All Rapid parts/descriptions correct at 2-October-2008. You should check part# and descriptions are correct when ordering in case I've made a mistake transferring them onto this page. 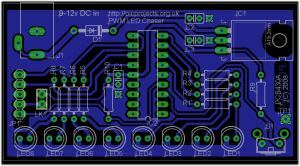 * You can use almost any type of 5mm LEDs of any colour with this circuit. *** If you don't have a power supply, this one should be suitable. In Fig 1. Fit diode D1. Note the silver band on the body of the diode. 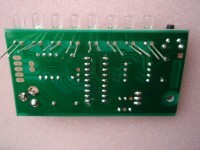 Ensure it is fitted the correct way round so it matches the PCB overlay. Fig 4. Fit the three capacitors, C1, C2, C3. C2 is marked '.22' and is a white rectangular part. Fig 7. Next fit the eight LEDs. You will see that one lead is shorter than the other. 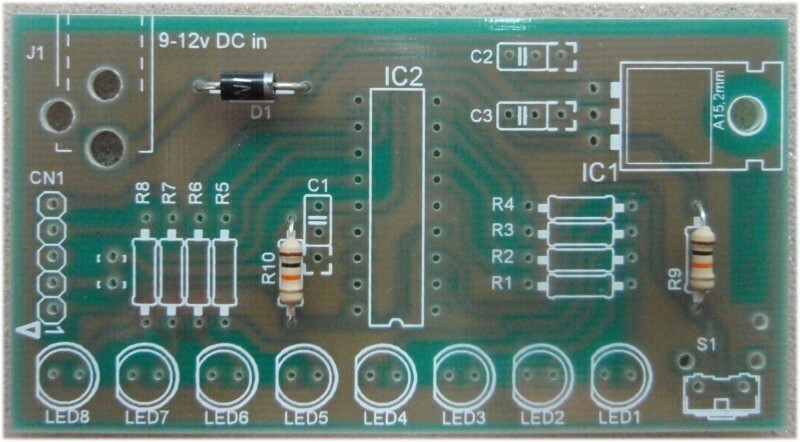 The short lead needs to be fitted into the hole nearest the flat side of the LED outline on the PCB overlay. Fig 8./9. 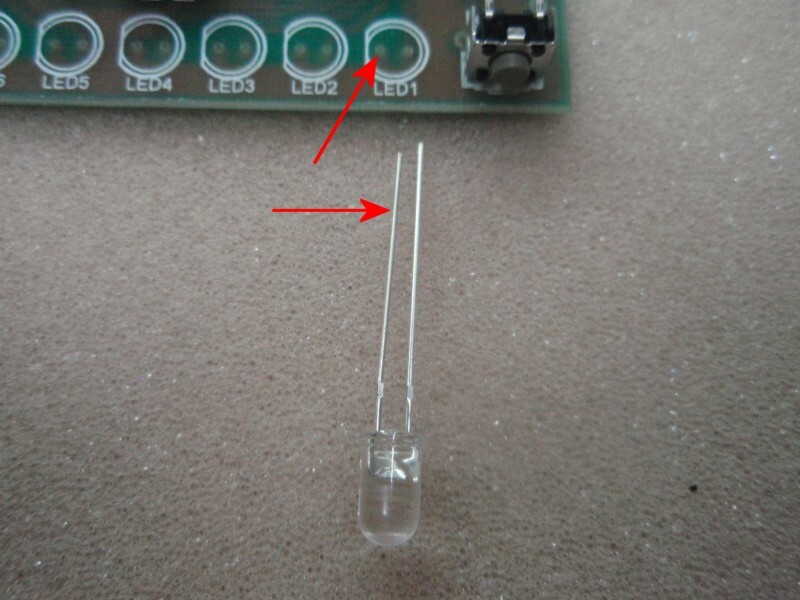 You will need to bend the leads of the LED through 90o as shown in fig 8. It is advisable to solder only one lead of each LED. Once they are all in place you can move the LED body to get them all aligned before soldering the other leads. 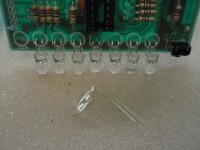 If you solder both leads you risk ripping the copper track off the PCB if you try to align the LED bodies. Fig. 10./11. With everything assembled and having tested the 5 volt supply, disconnect power from the board. Then insert the PIC microcontroller, IC2 into the socket. Be sure to fit it the correct way round. In fig 11 you can see a close up of the notch in one end of the PIC's plastic body. This must be aligned with the notch in the socket. Fig 12. 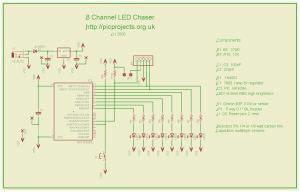 This photo show the completed LED chaser operating. 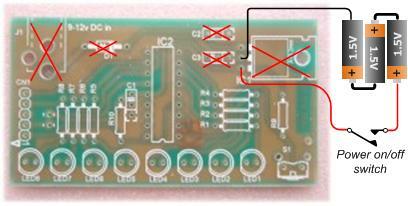 The board includes a 5 volt regulator and reverse polarity protection diode on board. You will need to use a suitable DC power supply rated between 8 and 12 volts and able to supply at least 150mA. In the UK you can buy a suitable power supply from Rapid Electronics. The part number for this is included in the component listing above should you not already have something available. If you plan on using this inside a PC as a case mod' you can power it from the PC power supply. Use the design unaltered and take the 12 volt supply from the computer fed to the DC jack input. Don't fit the 7805 voltage regulator and instead use the computers 5 volt power supply. Connect it where the ground and 5 volt out pins of the regulator were, leave the regulator input side unused. For either method if you're taking the power from a 4 pin drive connector ensure the unused power connection can't short out on anything inside the case. 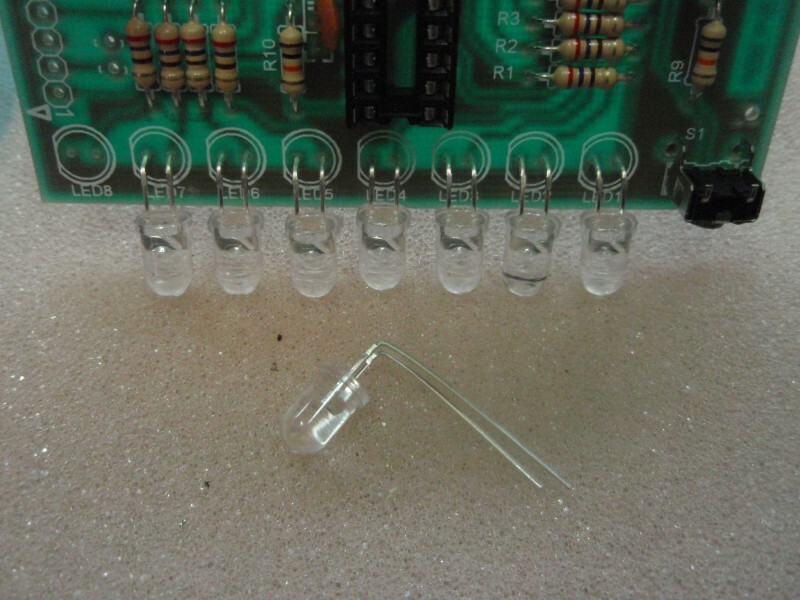 When fitting the LED chaser PCB, make sure the bottom of the circuit board can't short out on any metal work inside the case. If it suits your application, the circuit can be powered from batteries. Connect to the two holes where the the Gnd and Vout pins of IC1 would have been located as shown. Rechargeable NiMH or NiCd can be used but since their output voltage is only 1.2 volts, you need to use four. If you download the source code and look at the file named pwmc_SeqData.inc you can see the data used in the project. You might want to edit this file as a starting point to create some sequences of your own. The HEX files are ready to program straight into the respective PIC chip. The latest code version 1.0.7 supports the PIC 16F628/628A and PIC 16F88 microcontrollers. The PIC 16F628A is a newer revision of the 16F628. As far as the circuit and firmware on this page are concerned the two are functionally identical and you can use either part. The PIC 16F84A can also be used with the firmware on this page. You will however need to make changes to the hardware design and PCB layout to include an external 4Mhz crystal and load capacitors or a ceramic resonator, since the 16F84A doesn't have the internal oscillator of the 16F628A. Can you or how can I make it it run more than 8 LEDs? 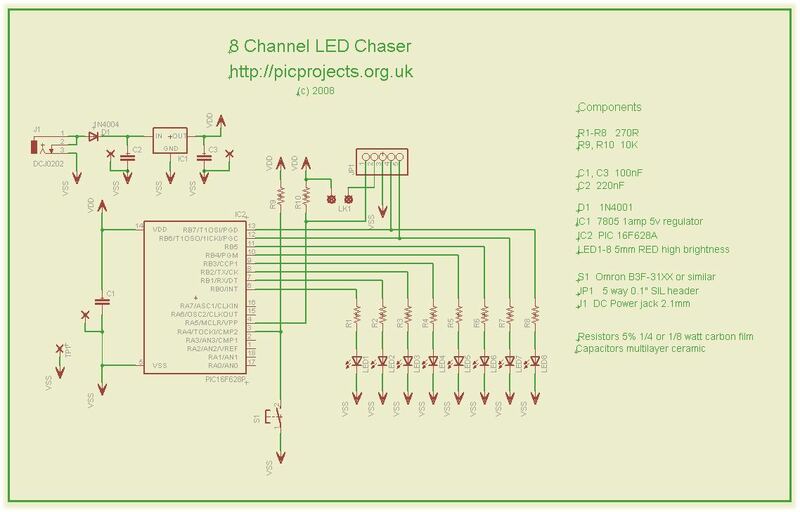 You can't add more LEDs directly to the PCB, however, if you want to construct your own circuit you can add more LEDs to each channel by using an NPN transistor. Can I get the sequences used on the round LED chaser? The YouTube video clips of the round LED chaser are running the same sequences as the inline chaser. They are all included in the HEX file available to download from this page. The code has been written to run on three of the most popular PICs available. If you want to modify the source code it could be made to run on other PIC types, however we won't modify the code.